Valley Boy ($13.95, 254 pp, 6×9 Trade Paperback ISBN: 978-1-60381-145-3), by Jack Remick, covers a year in the life of a third-generation Okie teenager who is struggling with the stigma of his heritage. —Robert J. Ray, author of Murdock Cracks Ice, and The Weekend Novelist Series. Ricky Edwards lives, works, and plays in Centerville, a small California town in the middle of the Valley. Ricky has a gift for music but he’d rather fight, drink beer, chase girls, and debeak turkeys. He debeaks turkeys because he wants a Lifters Car Club jacket with red lettering on the back. He fights because his long time pal, Linard Polk, teaches him about violence, fast cars, and guns—which drives Teresa, Ricky’s hyper-religious mother, nuts. She wants Ricky to escape the legacy of his daddy, an Okie skirt chaser who abandoned the family for a honky-tonk preacher’s daughter gone bad. If Ricky can just get out of Centerville, maybe he can make his mark. Says Remick: “When you grow up in the Central Valley you meet people who never stray much beyond their home town unless it’s to go next door to a football game. If you’re not the right caste, you learn to work with your hands and you work hard. You wonder if you can ever get out. I wrote Valley Boy in part to remind readers about the Diaspora, the Westward migration, that started in the Dust Bowl. Most people think the Migration ended with World War II, but it didn’t. In Valley Boy, the main characters are third-generation Okies who didn’t make it to the Pacific, got stuck in the dust, and were left behind in the orchards and vineyards doing the gut-busting labor that turns young boys into old men way too soon. I wanted to write about those Okie boys, like Ricky and Linard, who work and live with the bad taste of lost dreams in their mouths. Jack Remick is a poet, short story writer, and novelist. Valley Boy is Book Two of a series, The California Quartet. More volumes will be released by Coffeetown Press in 2012: The Book of Changes and Trio of Lost Souls. The first book of the series, The Deification, was released in December of 2011. Blood, A Novel was published by Camel Press in 2011. Also coming from Coffeetown in 2012: Gabriela and the Widow. Click here to find Jack online. 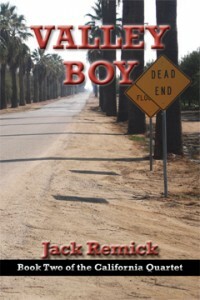 Valley Boy is available in Kindle and 5×8 trade paperback editions on Amazon.com, the European Amazons and Amazon Japan. Wholesale orders can be placed through info@coffeetownpress.com or Ingram. Libraries can also purchase books through Follett Library Resources and Midwest Library Service. You want to go out with me? You wanna go out with a Mexican? I wanna go out with you. What’s your mama gonna say? My mama don’t tell me what to do, Ricky said. What’s Linard got to say about what I do? I can’t go out with you. My dad will kill me if I date an Anglo. I’m an Okie, Ricky said. I’m not Anglo. Chela laughed and, curling her fingers in her hair, she smiled. Come on, Ricky said. I’ll take you to a movie. A Mexican movie? At the Centerville Theater? I wanna go to Fresno to the Cinerama. You tell me where and we’ll go there. You really wanna go out with me? Well, no one can know, she said. Not even Linard Polk. ’Cause of his pinchi brother, Kevin, you know? Yeah, I know Kevin. He’s in the Marines. Well, he knocked up Tony’s cousin and she hadda go to TJ for an abortion and she almost died. Tony’s cousin? Ricky said. Who’s Tony? Tony Avila, Chela said. My best friend, puto. Open your eyes and look around, man, ’cause you don’t know anybody in this pinchi school. Okay, Ricky said, I won’t say nothin’ to nobody. You better not ’cause if you do and my dad finds out he’ll beat the pinchi mierda outa you and he’ll kill me. You know what mierda is? I think so, Ricky said.